The present talk is divided in two successive parts. In the first one, we address the model computation and identification of nonlinear vibratory systems, with a specific focus on systems subjected to distributed nonlinearities, such as geometrically nonlinear mechanical structures. The proposed strategy theoretically relies on the concept of nonlinear modes of the underlying conservative and unforced system and the use of normal forms . Within this framework, it is shown that without internal resonance, a valid reduced order model for a nonlinear mode is a single Duffing oscillator. We then propose an efficient experimental strategy to measure the backbone curve of a particular nonlinear mode and we use it to identify the free parameters of the reduced order model. The experimental part relies on a Phase-Locked Loop (PLL) and enables a robust and automatic measurement of backbone curves as well as forced responses [2, 3, 4]. It is also theoretically and experimentally shown that the PLL is able to stabilize the unstable part of Duffing-like frequency responses, thus enabling its robust experimental measurement. As a validation, the whole procedure is tested on axisymmetric and asymmetric modes of a circular plate. In a second part, the above method is applied to chinese opera gongs, in order to investigate and explain their particular sound. These instruments exhibit geometric nonlinearities in their dynamical behavior such as a very characteristic pitch glide of the fundamental mode, that can be heard in normal playing conditions after the impact of the mallet and that is characteristic of this family of percussion instruments [5, 6]. Depending on the geometry of the gong, the pitch glide behavior can be either of the softening type - the frequency increases with time (xiaoluo gong) - or of the hardening type - the frequency decreases with time (daluo gong) . In this context, it will be shown that the experimental identification of the fundamental nonlinear mode of those gongs perfectly and quantitatively explains their characteristic pitch glide. 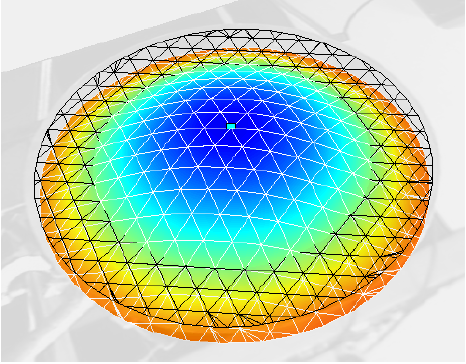 Moreover, it will be shown that some 1:2 internal resonances with high frequency modes are also present and explained by a reduced order model based on an ad-hoc normal form. C. Touz´e, O. Thomas, A. Chaigne, “Hardening/softening behaviour in non-linear oscillations of structural systems using non-linear normal modes,” Journal of Sound and Vibration 273, 77-101 (2004). 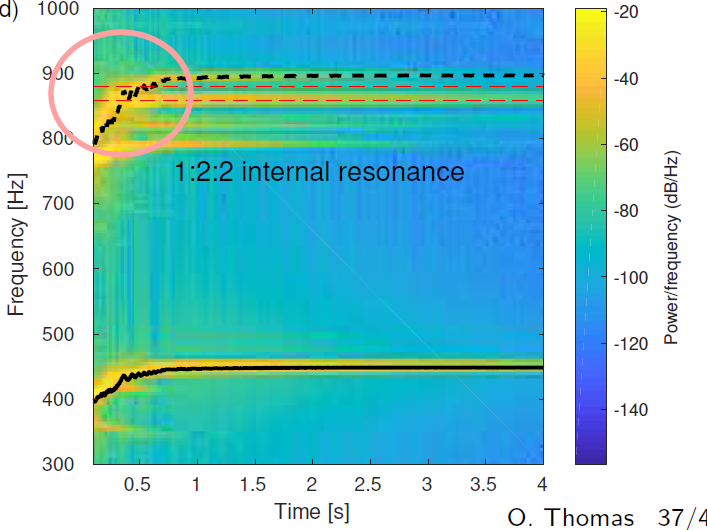 S. Mojrzisch, J. Twiefel, “Phase-controlled frequency response measurement of a piezoelectric ring at high vibration amplitude”, Archive of Applied Mechanics 86(10), 17631769 (2015). N. H. Fletcher, “Nonlinear frequency shifts in quasispherical-cap shells : Pitch glide in Chinese gongs,” J. Acoust. Soc. Am. 78, 2069 (1985). 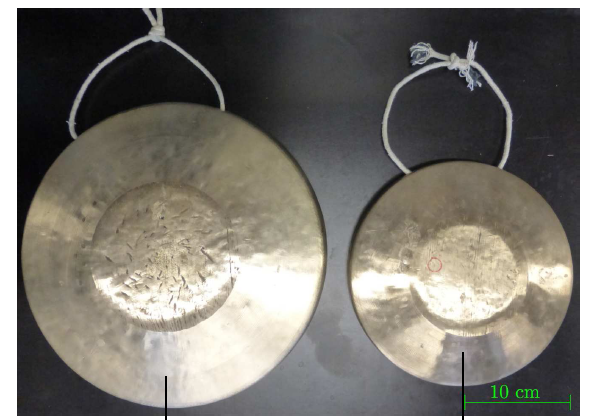 M. Jossic, A. Mamou-Mani, B. Chomette, D. Roze, F. Ollivier, C. Josserand “Modal active control of Chinese gongs,” J. Acoust. Soc. Am. 141, 4567 (2017). O. Thomas, C. Touz´e and A. Chaigne, “Nonlinear behavior of gongs through the dynamics of simple rods systems,” in Proceedings of the International Symposium on Musical Acoustics, Perugia, Italy, 2001.